Nearly 25% of all homeowners have experienced significant water damage from broken plumbing pipes and leaks. Your home or secondary residence doesn’t have to become part of this statistic if you are protected by WaterCop. This innovative monitoring and automatic water shut off system eliminates the headaches, costs and worries of dealing with flood damage issues such as insurance claims, cleanup and trying to restore priceless family keepsakes. Plus, it easily integrates into your security or home automation system. 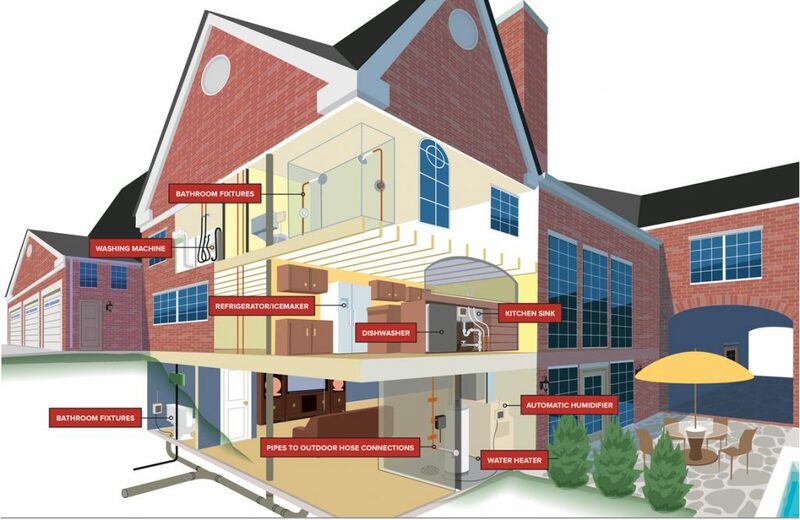 WaterCop offers a complete line of residential systems designed to cover almost any application. If you don’t see what you are looking for, please contact us to learn more about how our custom solutions can meet your specific needs. The WaterCop system utilizes an automatic shut-off valve installed on the water supply line of a home or commercial building. When flood sensors (installed near leak prone areas) detect a leak as small as a few ounces, a signal is instantly sent to the automatic shut-off valve to close the main water line. Water flow is quickly stopped to all downstream areas of your home or building, protecting the structure and everything that’s in it, from flood damage. With optional temperature sensors, WaterCop shuts off the water if the temperature drops below a certain predetermined setting; making it ideal for plumbing exposed to extreme cold environments. Designed for a typical single-family home or vacation residence and offers thorough plumbing leak protection. Provides central monitoring and control for complete leak protection required in homes and multi-family dwellings. Integrates with smart home technology for remote control of the main water supply valve. Single point leak detection and automatic shut-off system.